Ten years ago, Dr. John C. Mason Jr. had a vision of opening a dog park so pooches, such as his own Maggie, and people could socialize. Co-Chairman Mason was late for the meeting so the meeting was initiated by EGrzelak, Sec/Treasurer. Following her report Co-Chair Mason returned. The Treasurers report will be displayed in its normal location. WELCOME: Co-Chairman JMason The meeting was called to order at 5:30 PM by Sec/Tres/ Egrzelak. Co-Chairman welcomed and thanked all in attendance. He reminded the group that we had come a long way since our meetings to gauge interest and start raising funds in 2007. From our formal memorandum of agreement with the City of Danville in April of 2009 to the Grand Opening Gala in June 2010 and now the completion of the Special Needs section and Security on June 13, 2017. All of us here tonight along with many others aided with their time and money. Now all in the City of Danville and the surrounding area have beautiful Fetch Dog Park to enjoy. I feel sure the Espenscheid family would appreciate the beautiful addition within their gift. One of our valued early members of the Leadership Team, Ruth Schatz passed away recently. We want to recognize her memory and her contributions to our park with a tree in her honor. We share her loss with her husband and member Joe Schatz. ⦁ New projects: Special Needs Area, Security system. These are completed and have enhanced the appearance of the entry area. New signage to be discussed in present meeting. The safety and cleanliness of the park has benefited. Thanks to efforts of members and the community anonymous donors we are now debt free. ⦁ Fence rails repaired and discards being left at base to discourage digging under, preservation spraying to be done on special needs fence by DJacobs soon. ⦁ Drainage working great on north end of park. Thanks to the “Bridge and Lake Mistake “engineered by JVenute. ⦁ Grass, weeds tallgrass: The weeds are being monitored and sprayed by DJacobs. Anti-Crabgrass efforts of past seasons have decreased the amount to manageable. No further action planned. The tall grass is being monitored and mowing has been contracted for. Concern about future and reliability of present mower led to decision to begin stockpiling funds for eventual replacement. ⦁ Membership: Retention and promotional effort done in past were reviewed. EGrzelak has colored brochures available for members to use and disseminate. DJacobs has made presentations to requesting clubs such as Rotary. Providing information material to stores for “stuffing” is no longer considered-not cost efficient. Development of a trial partnership with the Vermilion County Adoption Van to accompany them and have information on Fetch available to this population needs to be further evaluated. Having Leadership available in case of prolonged absence has been successfully dealt with utilizing a Co-Chairman (Brad Wheeler) and volunteers taking over areas of the Sec/Treasurer function assisting EGrzelak. ⦁ Review concluded and after a brief discussion the report and previous meetings were approved by voice vote. TREASURER REPORT: EGrzelak report dating from November 12, 2016 to June 13, 2017. Copy of report to be attached to minutes. Issues of fob loss, deactivation of fobs, and projected expenses were discussed and will be addressed at current meeting. Following discussion the report was approved. MAINTENANCE REPORT AND DISCUSSION Co-Chairman BWheeler presented and all volunteers as mentioned in summary are active and much appreciated. ⦁ BWheeler wanted to know what the Team and SLane thought about the park mowing in terms of frequency and appearance. The Team unanimously expressed support and appreciation for the mowing being done by KFretty and BWheeler. SLane concurred. Mowing would continue to be done as they judged it necessary. SLane was thanked for safely providing the gas needed and he was asked that since park was debt free should it be purchasing the gas. SLane reported the City was getting more than their money’s worth as a result of the availability of this new asset to the city parks and the mowing of the trails. The same reasoning applied to use of weed killer. ⦁ Signage TClayton presented the signage changes planned for the park. Over the past 3 months she has worked to rework the present signage to simplify the wording and reduce the number of signs. All of her efforts were communicated via email until the present format was agreed on. It was now presented to the team in its complete form as Plan 1. Printed descriptions of Plan 1 along with the Plan 2 option was provided by TClayton for clarification. All Team Members then participated in a question/answer discussion moderated by TClayton and SLane. After thorough discussion Plan 1 was formally accepted and TClayton was applauded for her excellent work and presentation. She then stated that with the help of the SLane and his department one of the signs had been completed with a slight change and she handed it to EGrzelak to present to the group. 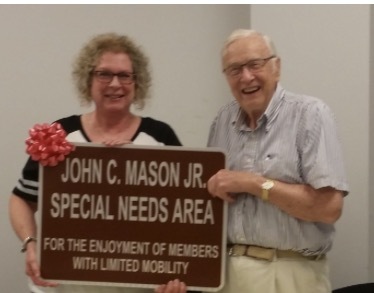 JMason was quite surprised and honored. He reflected on the history presented in the opening remarks of so many who worked to achieve the dream thanking all. ⦁ Fee Changes. With added amenities, especially the security system, and anticipated future expenses such as the new mower it was felt an increase in our fee for 2018 was necessary. The decision: $30.00 for 1 dog, $15.00 for second and any additional dogs would be $10.00 each. ⦁ Design an updated poster for distribution Vets, etc Egrzelak JMason to pursue. ⦁ Trial event with the Vermilion County Adoption Van to provide information and membership material to interested parties. JLinville agreed to explore idea with Vermilion County animal Shelter Foundation and try to set a tentative date for the trial. ⦁ VKoers suggested we explore developing a video (ie YouTube) that could be used as a link from our Fetch Dog Park web site. Views of the site, entrances, security system, and parking with members and their dogs enjoying the area would be able to be viewed by many. It could also be used at events to illustrate the park in presentations. This suggestion was approved by all and VKoers agreed to proceed with research and development of this exciting idea. ⦁ Rules for Special Needs Area were discussed and it was felt that People with special needs had priority. Other circumstances such as dogs that needed “cool down could also use the area. ⦁ A means to identify Park Rangers other than a vest or cap was discussed. There is a definite need for this in some of the members/handlers who flagrantly ignore the rules. After discussion a lanyard system was approved. It will be implemented by EGrzelak . WEB SITE EGrzelak The redesign of our web site has been completed and its new format is appealing and much easier to use. Thanks to Christina Hardwick who is now the owner. She has continued the great work of Steve Foster who was the founder and owner of the BEAMSCO Company for many years. He appeared at one of our early meetings and said “you need a web site to achieve your dream and I am giving you one” .Little did we realize what a great gift that was. EGrzelak discussed an additional change coming up that will be a section called Etiquette. This will help potential members become good and responsible members. John C. Mason Jr. June 17, 2017. Roll call, sign in, welcome: The meeting was opened by Chairman Mason who summarized items from our September 2015 meeting. Those minutes had been circulated by email and were approved. Following the last meeting the Shadly’s resigned. I discussed the issue with her and she had compelling reasons for her decision. The main topic in that meeting was the need to increase membership and we have had very little success and this issue will be addressed in today’s meeting. Treasurer’s Report was discussed by Elisabeth Grzelak (copy included). Of note were the bills for the fencing completed in our special needs project (3500.00) and the sale of 98 tags with income from them of $1,650. Our present balance is $11,141.92. This is our total (including grants) as the funds in the city account have all been utilized for necessary expenses. In May our liability insurance premium of $863 will be due and they have been informed of our special needs project and security to see if that will require additional premium. The Treasurer’s report was approved. A detailed update on the progress of the special needs area and the security system was provided by Darrel Jacobs and Jerry Venute as they have been the lead volunteers in its construction. Darrel started the discussion by thanking all members of the team and others for their help and wishes that more help could have been available. The fencing is up and all 3 areas are now clearly distinguished. The concrete pads (parking and special needs) and sidewalks were just finished. Consultation with C2 engineers , Paul Offut and others was necessary to ensure all was up to code and could drain adequately. As soon as the City completes the electrical connection near the entry the security system (Wagner Security) will be installed and special gates will be installed for the special needs area. Access to water will come also to the special needs area. The good news is that it is almost finished, a distinctive, attractive area that we can be proud of. The bad news is that the costs went over budget and beyond the grants we have obtained. While all the bills are not in it is felt that the costs of labor, supplies and site preparation will be in the range of $13,000.00+ and concrete $6000.00 or around $20,000.00. The security system with installation and 100 fobs should cost around $2000.00. We will be able to terminate a membership for cause by an adjustment in the control box so that his fob is no longer active. Considering our present balance of $11,000.00 we are going to have to come up with 11,000.00 to cover just these costs. Following a lengthy question and answer session a motion was made and seconded to approve the report and the vote taken. The report was approved. Fund raising efforts will be discussed in new business. Maintenance-plans, projections and projects were presented by Jacobs, Venute, Wheeler and Fretty. The fence rails (horizontal) are our main problem. We have been advi9sed to spray them with bleach and then follow with an expensive chemical spray. This has consumed money and countless volunteer hours but is now complete except for the new fence for the special needs area. It is anticipated this technique plus touchups will add life to the rails. This rapid deterioration was a disappointing surprise to all of us that had planned this fence. The chemicals are on hand . The drainage for the north end and mid park has been improved with fill and tiling. The north end now has two new entities “The Bridge and Lake Mistake” One more new tile is planned for east of the Bridge and Lake Mistake. Spraying of weeds and thistles will be done by volunteers as last year. Fretty, Wheeler, Venute are the mow volunteers and will be requesting city help to get the mower ready for summer season. It is hoped we can acquire a mulch blade. It was pointed out that our mower was used when purchased and one of these days it will be necessary to purchase another. The abbreviated rule form was presented by Elisabeth Grzelak. It is essentially the same as the back of our rule book and those posted on the sign at the park. It was approved as presented by vote. A copy will be enclosed with minutes. This lead to our discussion of what type of brochure do we need to develop to promote the park and make people aware of its new improvements. Much discussion followed as to what should be the contents. Short rule form? Membership application for tag? It was finally agreed that a new form be developed with pictures and description such as were developed for our fund raiser with Carmack Car Capital. Elisabeth will proceed to develop it with Cassie who was very instrumental in the event. She created a beautiful form and we need something similar that will emphasize our Special Needs area and new security system. The members present at the meeting felt that the new security system will be a big plus in encouraging dog owners to join. Once this new brochure is completed we can approach merchants to “stuff” it with their merchandise. For example Pet Supplies Plus has been very helpful. It is so critical that we increase our membership so adequate income is generated to maintain the park. We must obtain volunteers to re-visit all the veterinarians and groomers to get the word out. Depending on location and activity the admission and rule forms could be incorporated in the presentation. We must also make the rounds of all the service organizations with this update and in the presentations a plea for financial help can be incorporated. The Humane Society inquired about having access to the park so that their volunteers could exercise dogs that are being held. The Humane Society is only able to afford rabies vaccination on these dogs and many times only a much abbreviated history about aggression or other undesirable traits is known. The final consensus was that in view of unknowns and potential risk to present members and their dogs we would not be able to permit their entry into the park. All present members dogs have been vaccinated against Leptospiral virus and the Humane Society cannot afford this. However this is not a closed issue and if changes are made it can be re-visited because it could be a good thing for the community. The question was raised by Darrel Jacobs about the feasibility of offering FETCH hats to new Rangers or friends of Fetch. After discussion it was felt it would not be wise to consider any new expenses considering our financial position. We think it is good for identification of the Rangers but feel we should ask them to purchase their own. If anyone wants to purchase Darrel has the name of a provider. This approach was approved by those present. The final item for discussion centered on what we could do to raise funds to cover the debt that has arisen in the construction and development of our new project—Special Needs and Security. Member David suggested that we re-visit the grants from Wheeler and Cadle hoping they could allow some more funds. It was also suggested we reach out to Foundations such as Presence and Vermilion HealthCare to see if they could help or have suggestions. We should also make presentations to the service clubs not only for promotion as mentioned earlier but to seek their help with donations. AMBUCS with their history in the Special needs area will be contacted. John Mason will make contacts in these areas. The question of forming a 5013C was re-visited. For the size of our operation and the cost and effort to maintain it did not appear to be a helpful option. At 7PM the financial topic and its discussion were exhausted with no emergent solutions apparent a motion was made to adjourn. When all the bills are in it may finally require some type of loan until we can raise the funds. The Team and its members will continue to search for solutions.